Thank you for making an investment in compassion. As a supporter of American Humane, you are part of an organization that has been working to make historic advances in the humane movement for the benefit of children and animals for more than 138 years. From the creation of the first protections for farm animals to the creation of the child labor laws, saving the Bald Eagle, keeping children and pets safe from abuse, researching ways to reduce the number of animals euthanized by keeping them in loving homes, and pioneering animal therapy to help veterans, military families, the ill and the aged, American Humane has been there for the most vulnerable since 1877, making history – and a better world. Over just the past 12 months, we doubled the reach of our lifesaving and life-changing work to protect children and animals – touching 40,000 lives a minute with innovative and effective programs, prevention services, and outreach designed to stop abuse and cruelty, and create a more humane world. We made headlines around the globe as we unveiled the clinical trial of a groundbreaking effort to help children with cancer. We rescued and cared for animals caught in disasters and heartbreaking cruelty cases that captured national attention. We went to Capitol Hill to demand the return of American military hero dogs left overseas and, for the first time in history, made it possible for our heroic four-footed veterans to receive the free specialty veterinary care they deserve after a lifetime of service to our country. And in a historic effort to tackle one of the last great frontiers in the humane movement, we expanded vitally needed protections to ensure the humane treatment of 1,250,000,000 U.S. farm animals – covering one of every eight animals on our nation’s farms and ranches. We are proud that the American Institute of Philanthropy’s CharityWatch named American Humane a “Top-Rated Charity” in both the “animals” and “children” categories, joining only a select few of the more than 600 charities monitored by the service. GuideStar USA, the premier source of nonprofit information, awarded American Humane the Gold Level, demonstrating our deep commitment to nonprofit transparency and accountability. These honors join a long and growing list of awards that demonstrate how and why we have been able to achieve so many historic firsts over the past 138 years. 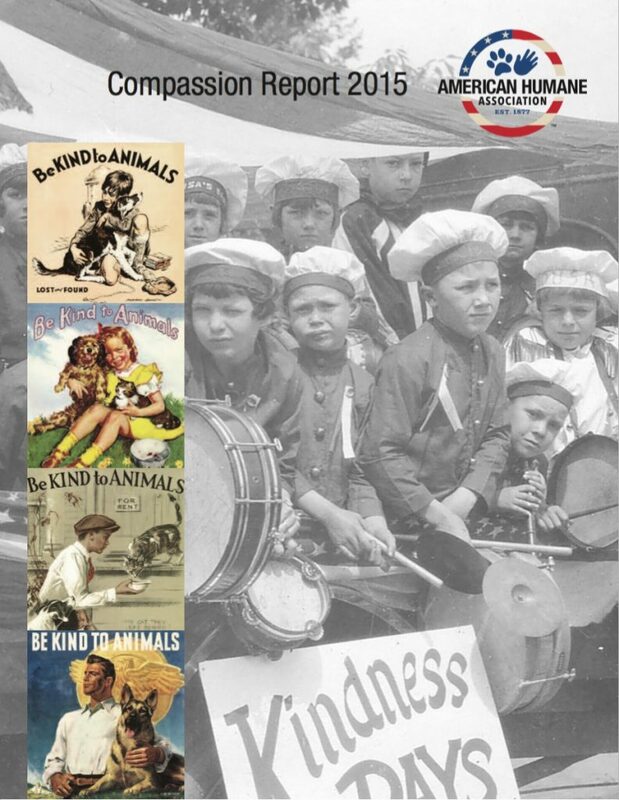 The 100th anniversary of our “Be Kind to Animals Week®,” the oldest commemorative week in U.S. history. We will be launching a major, year-long Kindness 100™ campaign and national media tour to spread our message and bring caring, compassion and hope to millions. The 75th anniversary of our “No Animals Were Harmed®” program, which has protected millions of animals in filmed entertainment since 1940. The 100th anniversary of our Red Star® Rescue Animal Emergency Services program, which began in 1916 rescuing wounded war horses on the battlefields of World War I Europe and which has saved, sheltered and aided millions of animals in disasters, including more than 80,000 in just the past ten years. We will be seeking to expand this lifesaving program so that wherever, whenever animals are in need, we can be there. Making an investment in compassion is important to pay it forward to generations to come. Together, we must end abuse, cruelty and neglect. We must pave the road for communities to embrace the healing power of the human-animal bond. We need to teach future generations what it is to be humane. By joining our efforts in these campaigns and supporting American Humane, you become part of a more than century-long effort to make historic change – and a better world for children and animals.